Home » Basic Concepts of Stock Analysis » Why Management Assessment is the Most Critical Factor in Stock Investing? Why Management Assessment is the Most Critical Factor in Stock Investing? On April 16, 2016, I got the opportunity to address a group of investors in an event “Investor Club” organized by MoneyLife Smart Savers, courtesy Mrs. Sucheta Dalal, Managing Editor of Moneylife and Mr. Debashis Basu, Editor of Moneylife. The session focused on the assessment of management quality while buying stocks. I was touched by faith reposed by the audience in me, who had come to Mumbai to attend the session from the locations like Vishakhapatnam, Trivendram, Kochi, Surat, Pune etc. The feedback of the session from the audience was very good and it was felt that the content was useful to investors while making investment decisions. Most of the investors, including me, enter the stock markets to fulfill a dream. This is a dream of financial independence. This dream is reinforced by the history of astronomical returns that some of the businesses have generated for their shareholders in the past; Infosys and Wipro being a few of them. I have always aspired to be a shareholder of any such company, which can turn my investment of a few thousands of rupees in to millions. This quest of finding the elixir of stock investing has led me into different directions in the past; first technical investing and then later fundamental investing. Read: Why I Left Technical Analysis And Never Returned To It! My quest for a guiding light, which could act as a beacon for the while I charter the hitherto unknown seas (to me) of stock investing, ended when I first read Intelligent Investor by Benjamin Graham in 2008 and later on letters of Warren Buffett to shareholders of Berkshire Hathaway in 2011. One of the key learning I could get from Graham and Buffett was that I should look at stocks not a trading paper to be sold at the flip of a coin, but as a part of a functioning business, which is to be held over long periods of time. Warren Buffett can feel himself as part owner of a business of his investee companies, because he usually buys significant stakes in those companies and has the wherewithal to influence the management decision. Whether he actually influences all or a few management decisions, can be a question of debate, but there has never been a doubt that his opinion is difficult to be ignored by management of his investee companies. However, when I see myself, or any other retail individual shareholder, as an investor in listed companies, I find that we are always nameless minority shareholders in these companies. Retail shareholders do not have any influence on the business decisions being taken by board &/or management. Most of the decisions get approved by consent of >50% shareholders and some critical ones get approved by the consent of >75% of the shareholders. 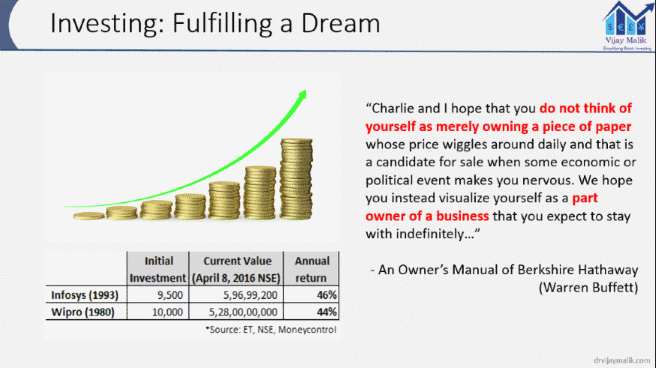 A retail investor usually has a very miniscule shareholding in a company. An investment of ₹100,000 in a company with market capitalization of ₹300,000 cr is 0.000003% of its shareholding. In such a situation, I had always felt that the notion of a retail shareholder being a part owner of a business is slightly over-rated. The hard fact of life is that a retail shareholder with a 0.000003% shareholding is someone whose opinion does not bear a lot of influence on business decisions and the retail shareholder has no other option but to accept whatever business decision is being taken for her by promoters or majority shareholders. A retail shareholder is not able to control where his investee company would deploy its cash; she is not able to control whether the company would pay dividend or how much dividend. Retail shareholder is not able to control who would run the company for her, in case the existing management leaves scope for improvement. She cannot control whether her investee company should do or not do an acquisition. A shareholding of 0.000003% is simply not large enough. Therefore, at the end of the day, a retail shareholder feels that her fate is in the hands of the management/promoters/majority shareholders of the company. Whether the said management would think of her best interests while deciding about future of the company or its business, is out of her control. At best what she can do is to vote with her feet: sell out her shares and leave. In such a tough helpless situation for a retail shareholder, I have always felt that the real risk that a retail investor is carrying, while investing in stock markets, is not that the company she has invested in, would perform bad. The real risk she faces is the management/promoter who controls the destiny of the business and the returns that she would get from her investment, might not think about her when deciding about the company. The retail investor might have invested in a very good business. The business might be a cash cow, generating crores of surplus cash year after year, but if the management/promoter decides not to share it with the retail shareholder, she will never get even a single rupee out of it. The retail investor has always found a management/promoter/majority shareholder standing between the fruits of the business and herself. If the management decides to appropriate these fruits of business to themselves, there is hardly little a retail investor can do except to sell out her shares and leave. it is a trust in the majority shareholder. If the management/promoter/majority shareholder decides to breach this trust, then there are very limited options available for a retail shareholder. Therefore, I approach equity investing while keeping these thoughts/rules of the game in my mind, which make management assessment as the most critical aspect of stock selection. This is not to undermine the importance of other aspects of the process of stock selection. It is to emphasize that even if an investor has satisfied herself about the financial, business and valuation analysis of any company, if she is not able to get the confidence from her assessment of the management of the company, then she should rethink her investment decision. However good the business of the company be, however large competitive advantage (moat) it might claim, however attractive its current valuations be or however strong its financial position be, if the management is not minority shareholder friendly then it is highly likely that she will not make money despite sustained good business performance of the company. An over-ingenious management/promoter/majority shareholder would always find ways to benefit at the cost of minority shareholders. Such cases have happened in the past and as we understand that history repeats itself, would surely happen in future. Gujarat Automotive Gears Limited is a small cap company with market capitalization of ₹33 cr. it was established in Baroda in 1973. The company makes auto and tractor components including transmission gears and axle shafts. Its products target OEMs and after-markets in India and sell under the brand name of KAG in India. The company also exports its products and has United States of America, Germany, Italy, United Kingdom, Belgium, Egypt, Dubai, Sri Lanka, Singapore, Malaysia, Thailand, Australia etc. as its overseas markets. Gujarat Automotive Gears Limited was first brought to my notice in April 2015 by one of the readers of my website “Venkatasubramaniyan Natarajan”, who has shared his analysis of the company and has asked for my inputs. Has a cash chest, which was swelling year on year because its business was a cash cow. Such a business is always a prize catch to investors and there was no surprise that in July 2013, the company was acquired by HIM Teknoforge Limited for ₹21.8 cr. when it purchased the 55% shareholding of erstwhile promoters. The company went on with its business as usual under the new promoters and finished the next year, FY2014, by generating the highest ever sales of ₹29 cr. and profits of ₹5 cr. However, the investors were in for a surprise when the balance-sheet of Gujarat Automotive Gears Limited at March 31, 2014 was made public and it showed that the cash holding has reduced from ₹6cr. in FY2013 to ₹1 cr. in FY2014. The usage of cash remained a key issue to be found out as the company has not used it to pay dividend to its shareholders. The analysis of the balance sheet at March 31, 2014 showed that Gujarat Automotive Gears Limited has utilized its existing cash reserves (decline by about ₹5 cr.) as well as the profits generated in the year FY2014 (increase in reserves & surplus of about ₹4.5 cr) to provide loans & advance to some entity (increase by about ₹10 cr.). 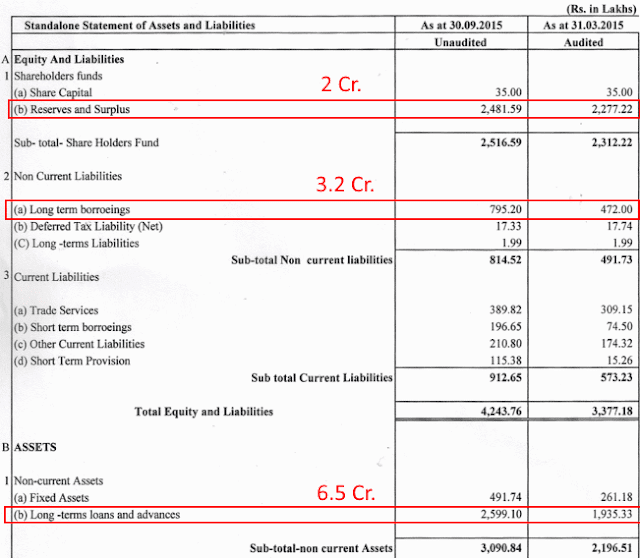 Balance sheet of Gujarat Automotive Gears Limited showed that it had only about ₹3 cr invested in the fixed assets used to make products to generate its sales & profits, whereas it has given a loan of about ₹10 cr to some entity.Such kind of loan, which makes loan assets more than fixed assets reflected that the management of Gujarat Automotive Gears Limited is finding more value in lending the money than investing it in its core business. As this business decision of the Gujarat Automotive Gears Limited had important implications, it becomes imperative for any investor to find out who is the entity to whom this loan has been given. Details in the related party transactions section revealed that Gujarat Automotive Gears Limited has given a loan (inter corporate deposit) of ₹9 cr. to HIM Teknoforge Limited in FY2014. This action by Gujarat Automotive Gears Limited meant that it has used its cash reserves and its entire profits for FY2014 and used it to give a loan to HIM Teknoforge Limited. HIM Teknoforge Limited is no one but the new promoter of Gujarat Automotive Gears Limited, who has acquired it in July 2013 by buying 55% of the shares in the company. It effectively meant that the new promoter, HIM Teknoforge Limited, within a few months of acquisition of Gujarat Automotive Gears Limited has used it as a source of funds (to the extent of ₹9 cr) to serve the purposes of HIM Teknoforge Limited. I doubt that minority shareholders could have controlled the loan, which HIM Teknoforge Limited being the management & largest shareholder, made Gujarat Automotive Gears Limited to give to itself. Giving the benefit of doubt to the promoter, HIM Teknoforge Limited, that it might be a one of instance of financial issues with it that it has to take financial help from Gujarat Automotive Gears Limited, it made sense to analyse the fate of this loan over the next year. The investors got the surprise that the amount of said loan from Gujarat Automotive Gears Limited to HIM Teknoforge Limited, instead of reducing (i.e. 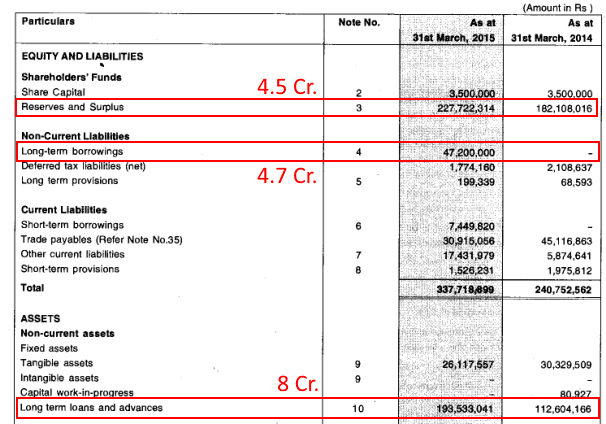 getting repaid) had increased from ₹9 cr at March 31, 2014 to ₹17 cr. at March 31, 2015. It meant that an additional amount of ₹8 cr was transferred as an inter- corporate deposit from Gujarat Automotive Gears Limited to HIM Teknoforge Limited during FY2015. It indicates that the new promoter, HIM Teknoforge Limited, is using the acquired company, Gujarat Automotive Gears Limited, as a continuous source of funds for its own purposes. Investors would notice that Gujarat Automotive Gears Limited used to make a profit of about ₹4.5-5 cr. every year, however, the loan amount given is more than the profits for a year. Investors would remember that the cash reserves of Gujarat Automotive Gears Limited had already been depleted to give the loan of ₹9 cr. to HIM Teknoforge Limited last year (FY2014). So the question arises, where did the balance money came from, which was used to give loan (inter corporate deposit) to HIM Teknoforge Limited? Gujarat Automotive Gears Limited in addition to using its profits for FY2015 (increase in reserves & surplus of about ₹4.5 cr), has taken a debt of ₹4.7 cr. and used it to give the additional inter corporate deposit of ₹ 8 cr. to its new promoter HIM Teknoforge Limited. Being the majority shareholder HIM Teknoforge Limited is effectively making Gujarat Automotive Gears Limited to take debt and then use these debt proceeds to give deposits to itself. An investor would notice from the financial performance of Gujarat Automotive Gears Limited until FY2013 that it used to have a strong business, which was a cash cow. Gujarat Automotive Gears Limited was accumulating cash chest and the need to take debt did not arise. Now, the management is making Gujarat Automotive Gears Limited, which still has the same good business, take debt to give loans to itself (to HIM Teknoforge Limited) and the cost of this debt (the long term debt of ₹4.7 cr. from SIDBI @12% p.a. GAGL FY2015 annual report, pg. 30) would have to be borne by Gujarat Automotive Gears Limited. This effectively means that shareholders of Gujarat Automotive Gears Limited are bearing the cost of debt which Gujarat Automotive Gears Limited is raising to give as inter corporate deposit to the promoter HIM Teknoforge Limited. The balance sheet of Gujarat Automotive Gears Limited for at March 31, 2015, also shows that the company now has only ₹2.6 cr. 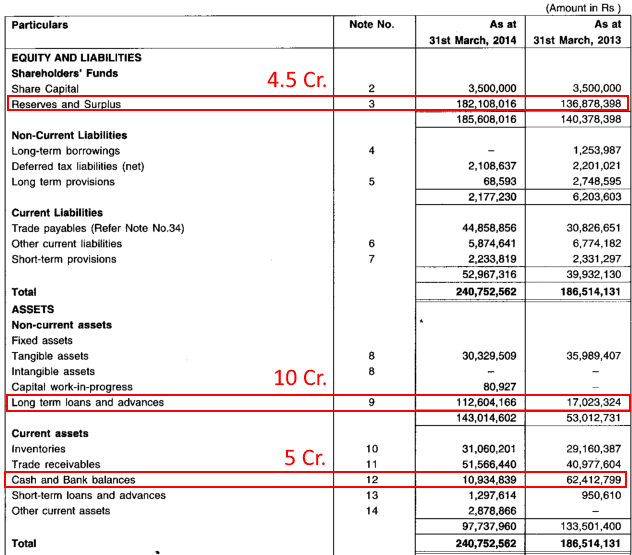 in fixed assets (plants & machinery) and whopping ₹19.35 cr. given as loans & advances. This accompanied with the fact that Gujarat Automotive Gears Limited is now taking debt from other financial institutions to give deposits to others, shows that the character of Gujarat Automotive Gears Limited is now changing from a manufacturing organization to a lending organization. I doubt a retail individual shareholders who has an ownership of a fraction of a percentage point in Gujarat Automotive Gears Limited, could have controlled any of these business decisions. Gujarat Automotive Gears Limited was becoming an interesting case generating curiosity as an investor analyses its development year on year. Therefore, I could not stop myself analysing the fate of the story to the latest available data available in the public domain. Gujarat Automotive Gears Limited has given an additional amount of ₹6.5 cr. as long-term loans & advances to others. The details of names of these parties would be known in the annual report for FY2016 would be available later. Gujarat Automotive Gears Limited has used its profits for H1-Y2016 (increase in reserves & surplus of about ₹2 cr) and has taken additional debt (increase in long term debt of ₹3.2 cr.) and used it to give the additional inter corporate deposit of ₹ 6 cr. Looking at the trend of actions of the new promoter HIM Teknoforge Limited for past 2 years, it would not come as a surprise that the additional deposit of ₹6 cr. is also made to HIM Teknoforge Limited. However, it remains to be confirmed when the annual report of Gujarat Automotive Gears Limited for FY2016 along with details of related party transactions is available in public domain. HIM Teknoforge Limited has paid ₹21.8 cr. to acquire control of Gujarat Automotive Gears Limited in July 2013 and until March 31, 2015, it has received cash of ₹17 cr. as deposit from Gujarat Automotive Gears Limited. The amount of cash received by HIM Teknoforge Limited from Gujarat Automotive Gears Limited could already have crossed its acquisition cost of ₹21.8 cr. if the additional loans & advances of ₹6 cr. given by Gujarat Automotive Gears Limited in H1-FY2016 also turn out to be given to HIM Teknoforge Limited. they have received almost entire consideration paid, back in terms of inter-corporate deposits and still enjoy control on the great cash generating business of Gujarat Automotive Gears Limited almost free of cost now. Effectively the shareholders of HIM Teknoforge Limited have made Gujarat Automotive Gears Limited pay for its own acquisition. The benefits of Past, Present and Future has been taken away from the shareholders of Gujarat Automotive Gears Limited and a retail shareholder with miniscule ownership of the company could have hardly done anything to stop these transactions being controlled by management/promoters/majority shareholders. Management stands as a mediator between the profits of the business and the retail shareholder. If the management of a company is not minority shareholder friendly, then retail minority shareholders might not get to share the fruits of profits of a company, however good the business performance of the company may be. Retail investors should work hard and try to sense the first sign of management playing smart with them and exit from the company. Else, such managements will keep on finding ways to benefit at minority shareholders’ cost. In case of Gujarat Automotive Gears Limited, if a shareholder could have observed the decisions of new promoters when details of inter-corporate deposit were disclosed in annual report of FY2014, then she could have avoided the transfer of earnings, which have continued to happen later on. The retail investor could have found some other investment opportunities where the promoter/management/majority shareholders are the ones who might be more shareholder friendly and invested in them. Cairn India Limited gave a loan of $1.25 billion (₹7,830 cr) to group company THL Zinc Limited at an interest rate of 3% + 3 month LIBOR (total current cost of about 3.60%), whereas Cairn India could have deposited this money in an FD by State Bank of India for 2 years and earned about 7.50-8.00%. The loss in the income is a cost to shareholders of Cairn India Limited. The decision of Maruti to enter into arrangements with its parent Suzuki in relation to the new plant in Gujarat has been questioned. Therefore, it is imperative that a retail investor understands that she needs to be very vigilant about management actions while investing afresh or staying invested in any company. Management is the most critical factor that would decide whether she, as a retail minority shareholder, would get benefited from the fruits of business growth the company. With this we have come to end of first part of this series of article, where I would stress about the importance and steps of management assessment while making stock investments. The current article highlighted the importance of management analysis. Please share whether you consider management analysis as a relevant parameter in stock analysis and your experience of management decision in the investment experience until date. You may share your inputs in the comments section below. The views and opinions expressed or implied herein are my own and do not reflect those of my employer, who shall not be liable for any action that may result as a consequence of my views and opinions. I have used the financial data provided by screener.in and the annual reports of Gujarat Automotive Gears Limited, while conducting analysis for this article.